Matt Walsh – who plays communications director Mike McLintock on ‘Veep’ – on real-life politics surpassing the HBO comedy’s outlandish storylines and the show’s surprising perception in D.C. Plus, the UCB founder on the trials of stand-up and trading places with Barack Obama. "What's unique about Veep is the process. We'll read scripts and then put them down and rehearse scenes, improvisational scenes, and then thewriters are in the room taking notes, and then the next draft represents the contributions, the discoveries we've made. And then we do that three or four times and even on the day if we wanna try something new or pitch the writers new jokes, they're very open. There's not a lot of ego, so it's very rare. "— Matt Walsh on the process of creating an episode of Veep. "It's unfortunate that our comedy is not as crazy as the reality. That's the truth of it. I mean obviously politics is serious business, and yet everybody in our show is fairly incompetent, including Selena, and everybody in D.C. says we're doing an accurate portrayal of D.C., which is worrying because we're not really good at our jobs. "— Matt Walsh on the comparisons between “Veep” and the reality of politics. "I think what'll happen is, because our show was written before the craziness of this election year, next year the bar has been raised for what's possible. I think in many ways it'll challenge us to come up with crazier ideas because it's allowed now." — Matt Walsh on what will happen if Donald Trump wins the election. "I think there's like a common core, midwestern values that...But I think it's very, I don't know it's cohesive, I think people, for collaborative art like sketch comedy and like improv, those values are reflected in that city for whatever reason." — Matt Walsh on why Chicago is the home of improv. Matt Walsh: "The beauty of improv is that you can go out after the show and commiserate, you have other people you can share the blame with. When you're doing stand-up you beat yourself up alone." Larry King: "Have you done stand-up?" 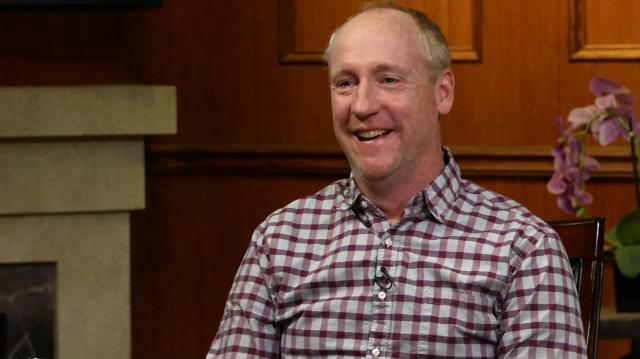 Matt Walsh: "I did stand-up for like two years in Chicago, yeah and I couldn't handle it. The peaks and valleys are just too hard. You could do the same material one night, kill, next night, same material, death, hate, shame. It's very difficult. "— Matt Walsh on the differences between improv and stand-up. "I was the middle child, so I learned quickly to not get beaten up by my brothers by making them laugh." — Matt Walsh on being one of seven children. "You're not asking for the laugh, or you're not playing it as funny, you're playing it as real." — Matt Walsh on comedic acting. "No. Absolutely not. It's always been filthy and foul mouthed. "— Matt Walsh on if “Veep” has gotten raunchier. "In comedy, you want a director that doesn't over note you, that gives you liberty to play and try things that perhaps aren't on the page. In general, a good competency technically, but a good mood on set, when comedians are uptight and nervous like they can't try things the comedy suffers." — Matt Walsh on what makes a good director. "I left my wallet home when I was traveling to D.C. to shoot something at the White House and I went to the airport and I realized I didn't have my ID. I got through security but it took another half hour and I had to have it FedExed to D.C. so that I could get into the White House. So she's basically saying, you idiot, don't forget your wallet next time. "— Matt Walsh explaining what Julia Louis-Dreyfus meant when she asked “Do you have your wallet?”. "I think she's a consummate professional, she loves comedy, would do it for free probably, and super smart and super...she's like human, the bonding that humans have, like she's normal, she gets what life's about. Which I think comedians have to have." — Matt Walsh on what makes Julia Louis-Dreyfus special.